The conference was over two days. 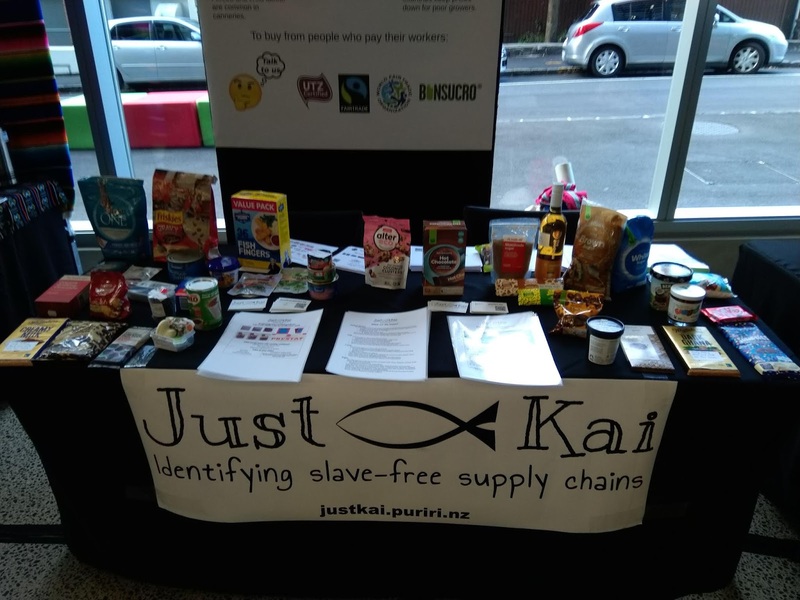 The first day was more aimed at helping businesses become more ethical in their practises; the second was more aimed at things ordinary people can do - ethical buying and advocacy. In practise there was a fair bit of overlap across the two days and most people attended both. dream big (because 20 million people are enslaved in the world today doing 'normal' jobs - agriculture, fishing, factory work etc. - and a big problem needs a big solution). I finished up with a quick overview of my Just Kai buying advice. We set up our table similarly to the Justice Conference, although we had more vertical space so put more information on our posters. 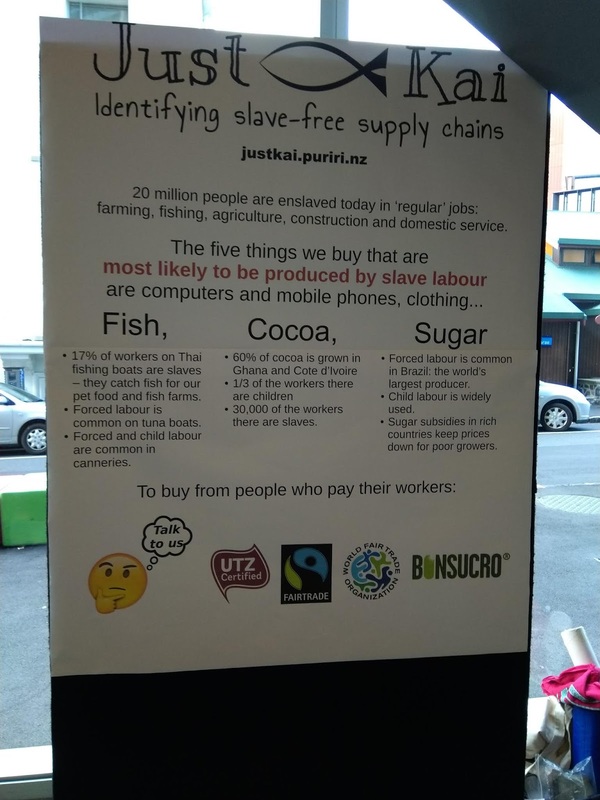 I'm not sure how well that worked, though: we still spent a lot of time telling people we're interested in buying fish, cocoa and sugar with slave-free supply chains, as well as emphasising that everything on the table was the 'good stuff'. We decided to put fewer groceries on our table this time, which was a good call - it was much easier to find the things we wanted to talk about to each person when there was less general clutter. on the one hand, I felt like Trade Aid is so much more deeply good than regular Fairtrade. 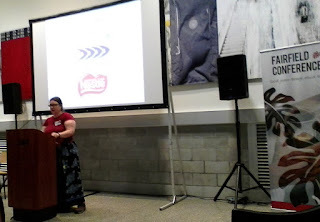 They are providing good jobs through-and-through (including in New Zealand, where they are transitioning to a Living Wage for all their paid staff - something they're obligated to do as WFTO members). on the other hand, they'll never solve world poverty (and Michaelia was very up-front that their solution isn't the solution to all the world's problems!). WFTO members are required to be small-scale producers making hand-made goods. I just kept looking around the lecture room. Hardly anything I could see (people's phones, people's clothes, their glasses, the floor covering, the projection equipment, the chairs etc.) was hand-made by small-scale producers, yet heaps of it was produced by people in very poor parts of the world. If we want to make most people's lives better, we need to crack into factories, not just wee co-ops in rural communities. But I do take heart from the fact that WFTO criteria are mostly determined by producers. If their kids keep going off to the city and getting atrocious jobs there, maybe the mums and dads will agitate for the WFTO criteria to be adapted to include factory jobs? Robbie Francis, who started my new favourite business - The Lucy Foundation. Robbie was born with a condition that means one of her legs needed to be amputated when she was really small, meaning she's basically always had one prosthetic leg. 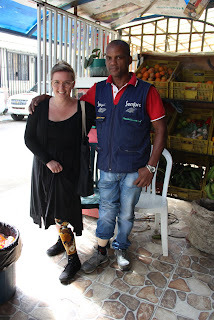 A few years back she was living in Mexico and ended up visiting a number of institutions housing people with physical disabilities who had been 'cleaned up' from living on the streets. They are kept in crowded conditions, drugged to keep them passive, they don't get any rehab and they are never expected to leave. She was horrified. That could have been her, if she'd happened to be born in Mexico. She hasn't come up with any ways to improve things for the people already in the institutions, but she has started a business providing employment to people with disabilities still living in the community - so they won't be homeless and vulnerable to such institutionalisation. 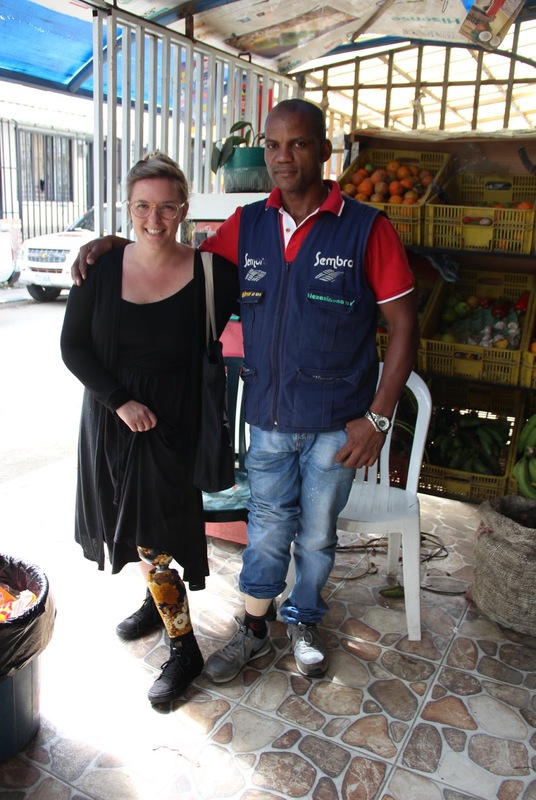 Her organisation, the Lucy Foundation, provides mixed-ability and disability-specific training in coffee growing and processing (so people with and without disabilities can work alongside one another) in Mexico. They also work with another organisation in New Zealand, Able Coffee, to provide barista training to vulnerable groups here. Super awesome!